The How-To Gal: David Stark Design Tip! "If you let your mind roam, Post-it notes and the paint chips from the hardware store have so many other uses than what they were intended for. We often use them to create amazing wall décor for events but they can be used as effectively in your home in lieu of framed art or instead of repainting. I actually got the idea of using paint chips as décor when attempting to choose the right color to repaint a room. Because it so hard to decide on a color from one little tiny chip, I once grabbed a bunch of the same color when I was at the hardware store, taped them all together on the wall to have a larger swatch in which I could envision my potential new wall color with and voila . . . in the process, I realized that my large “color chip” was cool in it’s own right. With a little double stick tape, you can tape the chips to the wall directly, creating a monochrome of color, a rainbow, or an image. If you are concerned that taping to the wall will leave damage, you can roll out a big sheet of white butcher’s paper or an even large piece can be cut from white photographer’s seamless paper, and that paper can be affixed to the wall in key places with a staple gun. Then tape the paint chips directly to the paper. By the time you are done covering every inch of the paper, it will appear as if your chips are directly on the wall. These same techniques work equally well with the standard Post-it note. Because they already have the sticky on the back, they are easier to work with, and there are two levels of sticky-ness: the regular and super sticky for those jobs that you need super sticky for! You can spell out messages or create pixilated images on the wall, your door, the bathroom mirror, or you can create the illusion of a headboard for your bed. I actually love the idea of drawing the shape of a headboard behind a mattress to give the impression that a grander piece of furniture is there. And when you wake up in the middle of the night with an idea for your new novel, you can write it down on your “headboard” so you don’t forget it by the time you awake in the morning. (wink!)" Thank you David for such an awesome idea! 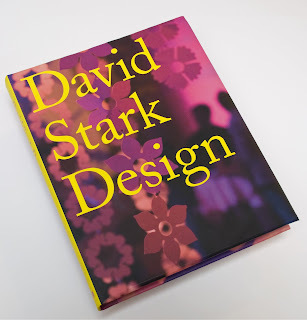 Did you know that he just published a new book, David Stark Design? Read more about it HERE. LOVE that idea. I have done that before, on a much smaller scale, though. That would be a fun back drop. I have been to a number of different Super Target and regular Target stores, in NC and in TX, and the Liberty of London collection has been very difficult to find. I don't know if it just sold out that quickly, or what. The few pieces I've seen, though, are quite pretty.